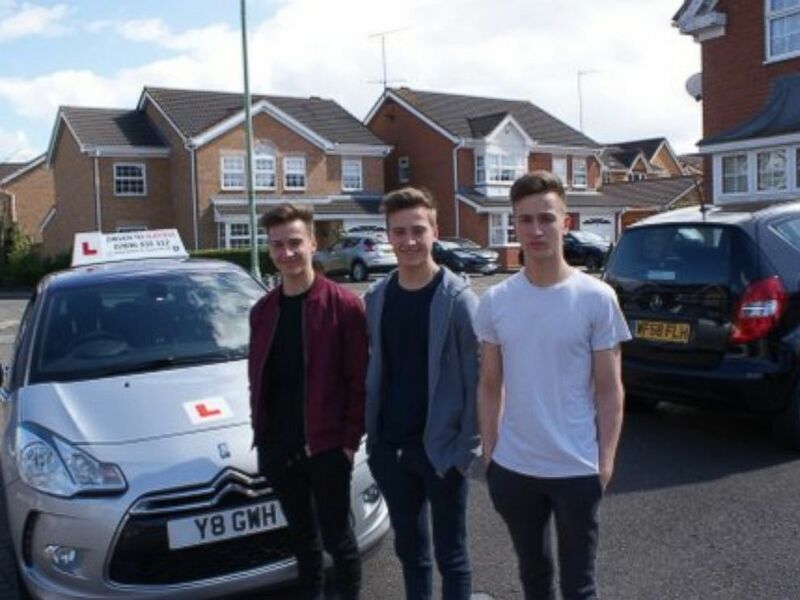 A set of triplets from the United Kingdom are hitting the road after all three siblings passed their driving tests on the exact same day. "I was a nervous wreck on the day hoping they would all pass," mom Triena Cassidy of Ipswich, Suffolk wrote to ABC News. "Cameron came back and told me he had failed. I was so disappointed for him, he then produced his pass certificate and I burst into tears. I then had to wait nervously for the other two." Cameron, Finlay and Ethan Cassidy, all 17, took their tests on Sept. 23 in that order, the same order in which they were born. Cameron, the eldest of the three brothers, said it was an "amazing feeling" to pass his driving test. "I was really proud of myself and relieved it was all over," he said. "I'm looking forward to my independence and new found freedom also not having to ride by cycle in the rain to school! It is now the start to a new chapter of my life." Ethan, who was the last to take the test, said he felt pressure knowing his two brothers had passed before him. "I was very relieved when I did," he said. "I'm looking forward to having the freedom of being able to get myself about and not relying on others. I have also promised to take my grandparent out for a drive." Cameron, Finlay and Ethan Cassidy of Ipswich, all 17, of Suffolk England, passed their driving tests on the same day, Sept. 23, 2016. Finlay said he was grateful to Jim Ho, the man that administered the exam for all the teens. "I was very happy to pass my test and thankful to my instructor Jim for all his patience and encouragement," Finlay said. "I was most looking forward to picking up my friends and taking them for a drive in my car and being able to go wherever I want." The boys took their tests at Driven To Success driver's training school in Ipswich and passed with flying colors, Jim the driving instructor told ABC News. "I've had three people pass on the same day, but they weren't related so this is a really special moment," he said. "U.K. driving tests are demanding. They didn't just pass, they passed really well so it was a fantastic achievement. The family is obviously happy." Proud dad Steve Cassidy sold the family car to give his boys some money toward cars and insurance. And while the triplets say they are dreaming of the likes of McLaren, a Lamborghini and a Mercedes-Benz, for now they'll be cruising around in the secondhand rides they've saved their allowances for.